I am 70 years old and a Vietnam war veteran and I was in the Tet offensive in 1968. I have retired as a school bus contractor for Worcester Co. My wife Rosalie, is 66 years old and is retired with 27 years as a Library Office Assistant with the Worcester County Library system. We have been married for 48 years and had one child, a son, who was killed in a auto accident at the age of 16. We do enjoy life as we have seen just how short it can be. 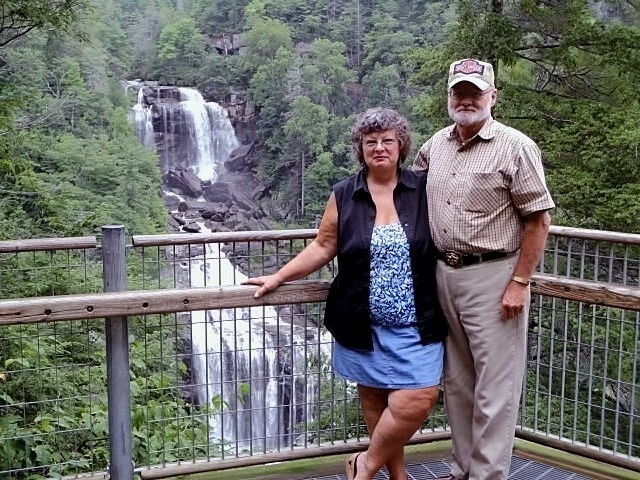 Here we are at the Whitewater Falls in North Carolina. At 411 feet it is the tallest falls on the east coast.